Selling Your Home in Brookfield, IL? Freshen Up that Curb Appeal! Home Brookfield Illinois Home Selling Selling Your House in Brookfield, Illinois? Freshen Up that Curb Appeal! Whether it’s time to sell your house, or just preparing for the newest change of seasons, there are probably some things to do in your yard – that is, unless you’ve already worked through this list from Nancy Miller of Coldwell Banker Residential Brokerage. True, being a real estate broker in La Grange, IL doesn’t necessarily mean that you’re suddenly a landscaping guru. However, what you may not realize is that Realtors are required to maintain their real estate licenses with continuing education. Amongst the many courses Nancy has attended in her career, marketing and driving appeal to a seller’s home is a continual underlying theme. Okay, so how DO you “freshen up” your home on the outside in order to appeal to home buyers or even just your neighbors in Brookfield, IL? Simply put: shine and declutter your home’s exterior. Searching for a little more detail on the things to do for results? Read on. Siding: power wash the outside of the house. If you have loose, peeling, cracking paint, you’ll need to have the place painted. Paint serves an important purpose that most home owners don’t think about: protection. Much like your car is protected from rust by your paint, your home is protected from the elements (rain, sun & even insects) with a good, solid coat of paint. Doors & Windows: Give your front door a fresh coat of paint or replace it. Power wash the windows outside and clean them on the inside. While cleaning out the inside of the windows, note if there are any gaps in the corners. Older homes tend to have older windows. As the frames settle over the years, it’s not uncommon to find small gaps in the corners that allow for insect entry. The simple fix is often a touch of caulk. Roof: Trim trees so that no limbs are touching the roof. If you find this a challenge or have power lines to deal with, consider hiring a professional tree trimming service in Brookfield, IL. 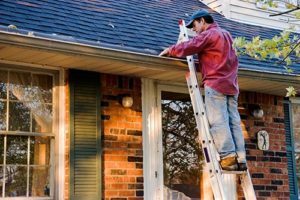 Clean out gutters and replace if they’re rusty, bent or look old and in disrepair. If you’ve lived through one or more winters in Brookfield, Illinois, you are well aware of the ice and snow we get on an annual basis. Clean and maintained gutters now helps prevent snow collecting and ice forming on your roof in the dead of winter. “Chi-beria” is a funny name, but still applies to what a Chicago winter can become. Landscaping: Plant bright-colored flowers and keep them watered and looking beautiful. Remove wilted dead blooms religiously. 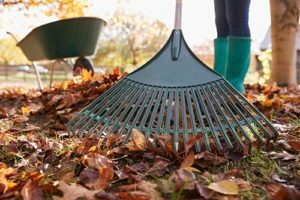 Rake up leaves and any dead vegetation and dispose of it. Get rid of weeds, dandelions and grass growing up through the driveway or sidewalks. Trim back unruly, unkempt bushes. Not only can dead plants make your home look unkempt, they also provide a surprisingly warm haven for mice and other rodents to nest. Considering adding some plants that are native to the Brookfield, IL area? See the Brookfield Conservation Commission’s lists a variety of native plants here. Put bikes, skateboards and scooters in the garage. Keep garbage barrels in the garage out of sight. Install low-wattage ground lights along the front walkway. Apply large, clearly visible house numbers to the front of your house. 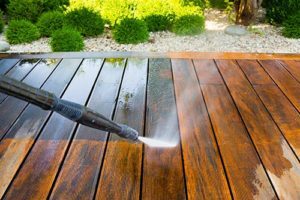 Power wash your deck or patio and sand and stain if necessary. Keep the lawn mowed throughout the sales process. Make sure sidewalks and walkways are edged neatly. Most of these tips make sense from a winterizing standpoint. However, if you are in the process of selling your home, make especially sure to give the list of “Special Tips for Home Sellers” an extra look. The real estate market is a competitive one in Brookfield, IL. That’s why Nancy Miller always encourages her clients, to give their home’s next owner a sense of excitement leading up to the door, rather than a mental list of things to do to improve the landscaping. The maintenance of the exterior of your home will indicate to potential home buyers how you’ve cared for the interior – help your house shine and you’ll be rewarded when it’s time to sell!